Friends, buy me a cup of ale and grant me leave to recount for you a lurid tale of ages past. You shall hear of the indomitable warrior Drako Terl, of the blind apothecary Iseuld Thyfe, of the scheming pettiliege Dubhan Treoir, of his beautiful and venomous daughter Saorla, of the deceptions and the intrigues of the brooding Keep of Treoir. You shall be left breathless by the rage of the enigmatic painted barbarians, who appeared as if by a whim of the god behind those impregnable walls, and rent the heads from the bodies of its highly-born and its servants alike. And of course, you shall discover dragonsbane, the mother of poisons, which was to hold sway over them all, and send no small sum of them before the goddess. Buy me a cup of ale and it shall be well past daybreak before my tale is done. Just to be completely clear, this book has no dragons in it. Its title refers to the traditional name of a particularly toxic concoction of mushrooms that probably would have been lethal enough to have killed dragons, had there been any about. The one on the cover is entirely decorative. Dragonsbane is, to begin with, an extremely long story. It’s published as five books of more or less conventional length, in that squeezing it into a single volume would have resulted in eye-wateringly small type and a tome that might have called for some manner of hydraulic support to read. 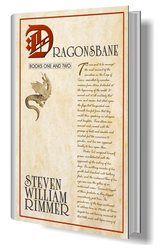 At present, the first volume of Dragonsbane is available through Amazon, and is in fact the book illustrated to your right. It’s referred to as “Books One And Two,” for reasons that will become apparent once you begin reading it. Dragonsbane is set a very long time ago — its internal chronology can be used to date it some time around the tenth century, if you care about such things. As it takes place in a remote part of central Europe, which has no contact at all with the rest of the “civilized” world of the period, the actual date is of little consequence. The world, from the perspective of the people in this book, consisted of eleven city-states, the villages that had grown up around them, and not much else. Travel wasn’t a huge industry during the middle ages. The Keep of Treoir, one of the less affluent of the prominent houses, was absolutely awash in conspiracies, intrigues and schemes. Its ruling blood, their subordinates, their servants, some of the surrounding villagers and probably much of the livestock were all plotting to murder, depose, swindle, marry off, rob or humiliate each other. Thus it had been since the creation of the world, and thus it might have remained — to everyone’s general satisfaction — had not a very large fellow covered in tattoos, armed with a sword almost as tall as he was and painted bright orange showed up unannounced one day, and set about dismembering all those he encountered. It was quickly appreciated that he hadn’t arrived alone. While Dubhan Treoir, the titular patriarch of the family, was coming to terms with his home being invaded by barbarians, he was also plagued with a faceless assassin trying to murder him. His eldest daughter had discovered one of his darkest secrets. His brother had plotted to turn his servant against him. It wasn’t even afternoon yet. One of the singular characteristics of anything written about medieval Europe is the predominance of christian politics in the lives of the people involved. It’s probably worth noting that Dragonsbane is unusual in this respect, as there isn’t a church to be seen anywhere. Disconnected from the mainstream of European civilization and likely having arisen from expatriates of the Roman empire, these people are just as pagan as they want to be. 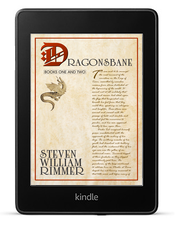 It may prove tempting for some readers of Dragonsbane to regard it as a subtle comment upon contemporary, twenty-first century political intrigues and mendacity. In a sense it is, but only to the extent that the ruling classes don’t change much from one millennium to the next. I hasten to add that I began writing Dragonsbane several years before the current regime of political clown acts attained power. The dragon on the cover of Dragonsbane was derived from the photograph Munich Dragon on the City Hall Building by Nino Barbieri, as uploaded to Wikimedia Commons, licensed under the Creative Commons Attribution-Share Alike 3.0 Unported license, the GNU Free Documentation license and the Creative Commons Attribution 2.5 Generic license. The cover graphic includes a detail from the photograph Ye Olde Scroll by John Hughes used under license from freeimages.com.